Next week’s T-Mobile Tuesday is bringing with it another special piece of T-Mo-branded merchandise. 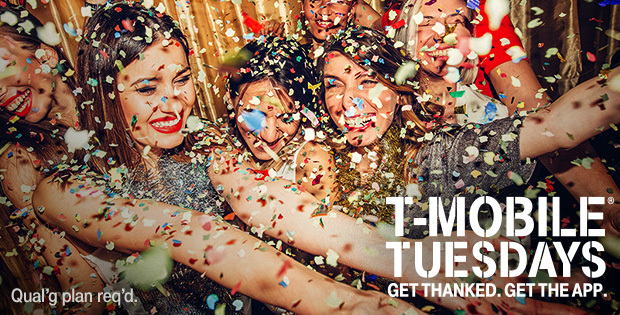 For the March 20 edition of T-Mobile Tuesdays, T-Mobile customers can score a free umbrella. 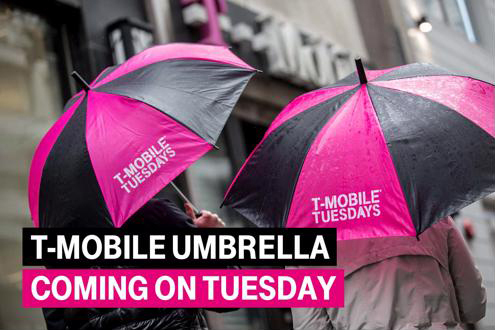 The umbrella features T-Mobile Tuesdays branding and magenta and black panels. Also included in next week’s gifts is a $20 dining credit for Dining Advantage, a service that offers 100,000 deals to local and national restaurants. You can browse through all the deals offered and when you find some that you like, you can check out using a promotional gift card code or your credit card and then redeem your offers whenever you’re ready. T-Mobile customers can get a free Vudu movie rental next week, too, as well as 10 cents off a gallon of gas at Shell. Rounding out next week’s gifts is 25 percent off all phone cases from T-Mobile and hotel savings from HotelStorm. Like last week, T-Mo won’t be offering any prizes to win during next week’s T-Mobile Tuesday. Are the umbrella 1-2 time use? Did anyone actually see this mythical umbrellas? The Silicon Valley T-Mobile stores didn’t have them. I snagged one in San Antonio, TX with no problem. Of course they’re not heavy duty gale force umbrellas – I wouldn’t want to see something like that, as that kind of cost would reflect back. But they’re fine as an “oh crap it’s raining” backup umbrella to keep near the door, or as a “keep the sun off your head” use kinda thing here in Texas. I don’t know… I visited 3 different stores trying to find one but none of them had any left. I got my umbrellas and offers.